Welcome to the Villchur Blog. I am Miriam Villchur Berg, the daughter of Edgar Villchur (1917-2011). My father was an inventor, an educator, and a writer. Audiophiles know him as the inventor of the acoustic suspension loudspeaker, which revolutionized the high fidelity industry. Audiologists know him as the inventor of the multichannel compression hearing aid, whose basic design has become the industry standard for hearing aids. In this blog, I hope to tell you some of the details of Edgar Villchur’s history, to introduce you to different sides of his life, and to shed some light on him as a person. Edgar Villchur was always mechanically adept, even as a young boy growing up on a farm. His family gave him confidence, drive, and a strong leaning toward intellectual pursuits. He studied art history, earning a master’s degree from New York’s City College in 1939. He planned to be a set designer, but World War II changed all that. Villchur was drafted in 1941, a few months before Pearl Harbor, and spent four years in the Pacific—New Guinea, The Philippines, and the Japanese island of Ie Shima. He rose to the rank of Captain in the Army Air Corps (which later became the Air Force). His job was repair and maintenance of the radios and other electronic equipment for the P-47 Thunderbolt fighters of the 348th Fighter Group. After the war, he decided to put his army training to good use, and opened a small shop repairing radios and building sound systems. Things were very different in those days. The term “high-fidelity” was not coined until the early 1950s, and stereo sound did not become popular for home systems until the late fifties. Radios in those days were large pieces of furniture, centrally located in living rooms and parlors, and families sat around them in the evenings listening to news, music, comedy, and serial dramas. Phonographs played 78 RPM records, which lasted four to five minutes per side. Recording tape was not used commercially until the late fifties. Villchur took some engineering courses at night to supplement the hands-on education he had received during the war. He analyzed the state of the home sound equipment then available, and realized that the loudspeakers were the weakest link in the systems. In 1954, he came up with a new idea for how to reduce distortion in loudspeakers. He applied for a patent for the acoustic-suspension loudspeaker in 1954, and was granted US patent No. 2775309 in 1956. 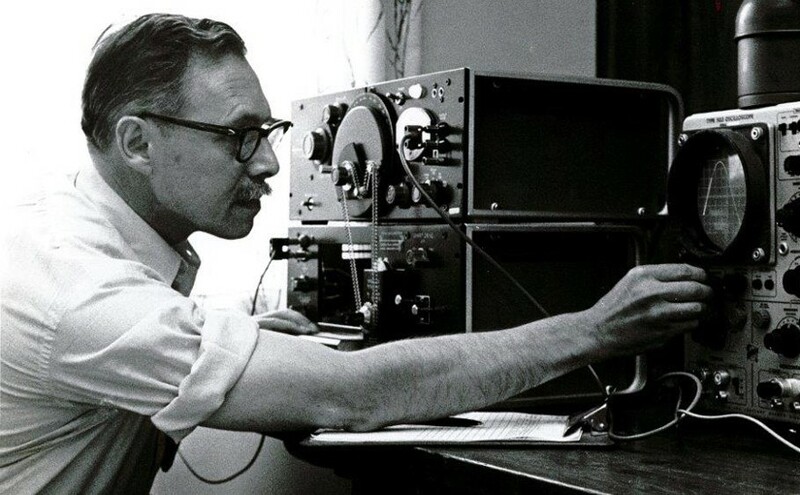 The story of how he got that patent, and how he started Acoustic Research, Inc. to manufacture loudspeakers, will be the subject of future blog posts. Villchur’s first speaker, the AR-1, provided better bass response than any speaker then on the market, at the same time radically reducing the size of the cabinet. His next speaker, the AR-2, was a no-frills model designed to be as economical as possible. Despite its low price, it was given the highest rating for quality by the independent testing agency Consumers Union, publisher of Consumer Reports magazine. Villchur continued to improve loudspeakers, coming out with new models roughly every two years. Acoustic Research continued to produce new loudspeakers and other components for the home audio market. AR’s market share grew to 32 percent by 1966. No audio equipment company had ever achieved that high a percentage of the market, and none has done so since then. Villchur’s AR-3 speaker is on display in The Smithsonian Institution’s Information Age Exhibit in Washington, DC. In 1967, Villchur sold AR to Teledyne. When he left AR, Villchur went back to working as a researcher. He chose the field of hearing aids, since he felt that there was considerable room for improvement in these devices. By 1973, he had come up with a revolutionary concept in hearing aid design—the idea of using multi-channel compression to make up for the variable loss of loudness. Each patient’s audiogram, combined with individual testing, would determine the correct program for that person. He never sought a patent for his hearing aid invention, preferring to offer it freely, through publication in journals, to companies who wanted to use it. Today, virtually all hearing aids make use of his multi-channel compression system. In future blogs, I will provide more details on Villchur’s inventions, including some of his ideas that have never been published. I also intend to write about his family history, his life outside of work, and his unique personality. Please contact me if you have specific questions about Edgar Villchur and his work. If I can’t answer them, I have technical experts who probably can.